ABR's original Homeland audiobook review and many others can be found at Audiobook Reviewer. 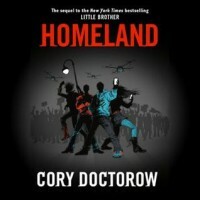 Homeland is the sequel to Little Brother, though the novel gives enough of the backstory for it to easily stand alone. If you would like a synopsis, please refer to the publisher’s review, it does an excellent job and would be redundant here. The title refers to The Homeland Security Agency (and the NSA) and their seemingly insatiable need to watch and capture every bit of information traveling the airwaves. Our beloved cell phones, smart pads and computers are as transparent to them as any window. Doctorow writes with authority and confidence about all things high tech, that which currently exists and that which is just around the corner. The listener is easily and comfortably guided by the author’s expert grasp of the technological nature of the material, neither overwhelming us with it, nor pandering to us. You don’t have to be a high-tech geek to enjoy this novel, because it affects all of us. And that’s where it gets truly frightening; because it’s real, not SciFi, not distant future tech, not aliens, but here and now government surveillance, using our very own gadgets to watch us, catch us and maybe even control us. After listening to this exciting and thoroughly enjoyable novel, this reviewer was shaken to his paranoid core. It’s real, only the characters and the storyline are fictionalized. There is no question that they are watching us, Edward Snowden convinced us of that. Now that we know, do we go back to sleep, or do we follow the advice in the several appendices of the book. Doctorow clearly practices what he preaches, even going so far as to keep this audiobook off of Audible.com because of its onerous digital rights policy, very likely harming his own audiobook’s sales. Wil Wheaton (yes Wesley Crusher on Star Trek TNG) does an amazing job reading the novel. There is even a part of the story where the main character meets Wheaton. This self-referential bon mot cracks the forth wall for a moment, something Doctorow seems to enjoy in this and his other books. Unfortunately, this excellent performance by Wheaten is slightly marred by the occasional lip smack or dry mouth noises that should have been removed in post-production. Fortunately, it is faint and should go unnoticed with ordinary ear phones or in a car. Don’t let this minor flaw keep you from enjoying an excellent performance. If you enjoy high-tech novels, with all-too-human characters, this is a must read. Authentic, informative, exciting, and way too real. Homeland is paranoia developed to an art form.